Everyone LOVES pushing the shopping cart. Everyone LOVES their new Nordic Ski Walking Poles even more! Both take the stress of the knees, hips and back. Not a miracle – just good physics. Mom will LOVE her new walking poles. Be sure to find poles for Mom that are safe, user-friendly, durable and trustworthy. Poles to avoid – poles made in China with cheap/flimsy twist-locks or flip-locks often prove to be un-safe, not durable and not trustworthy due to the poles not holding their settings. Collapsible poles often get shorter as you walk and/or collapse unexpected and fail altogether. Typically these poles are all made in China. Avoid collapsible poles costing $15.00 – $200.00 per pair. Collapsible poles rattle and vibrate. Don’t get scammed by collapsible poles from China. Why one-piece poles are safer, lighter, stronger, more durable and much more user-friendly. Because one-piece poles don’t have twist-locks or flip-locks they are radically superior. It is important to note that ski shops and ski rental departments all over the world only use one-piece poles and NEVER use collapsible ski poles because they are unsafe and they are not durable. Quality one-piece walking poles dominate in the mountains for hiking and trekking too. Quality one-piece poles also dominate in the city. 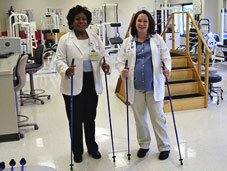 Quality one-piece poles dominate in physical therapy. Athletes destroy collapsible poles. Seniors should NEVER be sold collapsible poles. Collapsible poles can and often do collapse unexpectedly. Poles that are sized correctly encourage us to stand up taller and they help to radically improve our balance and stability. They also help to radically reduce the stress to the feet, the ankles, the knees, hips and back. Perfect Length Poles are often an ideal substitute for a cane or walker. 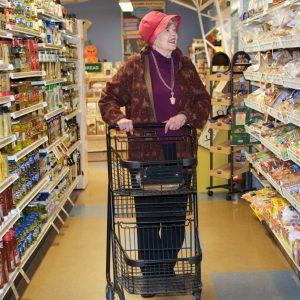 Most folks feel the best walking when they are pushing a shopping cart. Quality one-piece poles are even better than the shopping cart. Everyone loves pushing a shopping cart. Everyone loves their new one-piece walking poles from SKIWALKING.COM and the American Nordic Walking System. There are 32 different lengths of poles available to ensure a Perfect Fit for Mom on Mother’s Day. Don’t forget Father’s Day is coming up soon too.